What is a release of garnishment, and how does it affect me? When a creditor sues you, they eventually get a judgment in court. With this judgment, they can send a letter to your employer so that they can garnish your wages. But let’s say that you are currently being garnished, and they are hitting you for 25% of your paycheck. A release of garnishment would stop any future garnishments. However, I would not hold your breath on actually receiving a release of garnishment. If you look at the picture, you will notice that I didn’t bother removing my breakfast orange. It’s because the document really doesn’t say much. It says that the creditor releases the garnishment (for now). 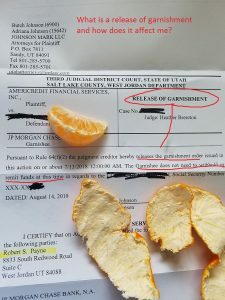 This means that payroll “does not need to withhold or remit funds at this time….” The Release of Garnishment even cites Utah Rule of Civil Procedure 64(f)(2), but they really mean 64D. The problem is that you’ll only see a release of garnishment if you file bankruptcy or pay off the judgment. 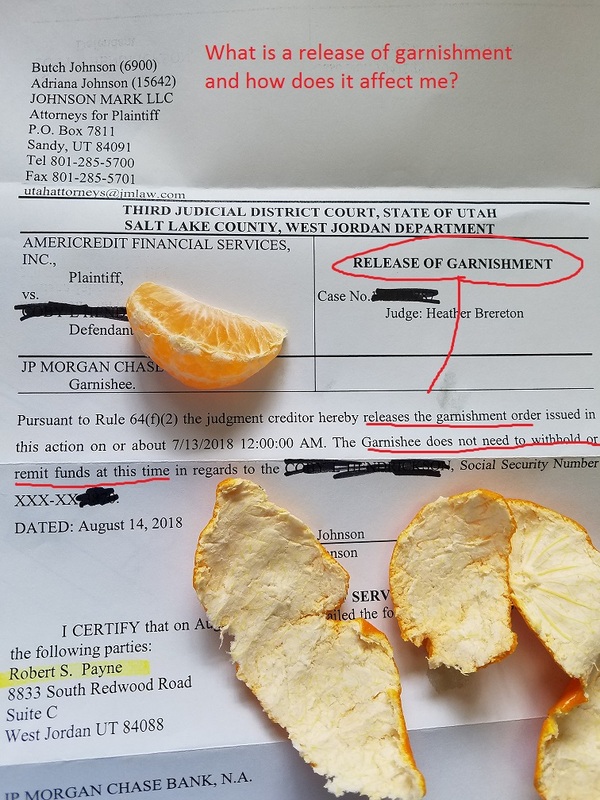 It’s a great court document to receive, but it’s pretty rare. This entry was posted in Utah Bankruptcy on August 21, 2018 by robertspaynelaw.